Coming off a not so hot year of costumes, we wanted to go big! We wanted to make a big impression at our high school, as it does not have walls and as we walked through the halls, students could see us from all over and caused quite a stir. 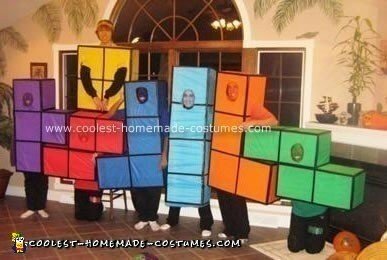 Although not all the Tetris Group Costumes were made to the same scale, we quick threw them together and had a blast doing it! The structure is thin, easily cut-able cardboard. We painted it all white to get rid of the Dairy Queen logo’s found on most of the boxes. We covered each one in a plastic table cloth of the correct color (RIP Factory Card Outlet) and then used electrical tape to box in the boxes. Like I said, we caused quite the stir and with almost minimal effort. We each wore a bandanna of our piece’s color, painted our faces to match our color, and wore a shirt of the color underneath, that way when we had to take off the box aspect, we could still be recognized. Also, we puffy painted sweat pants with the same design on each front saying TETRIS and the piece on the pant leg, as a reminder of this great time as we approach college and go separate ways. This was the cheapest costume I’ve ever encountered, about $1.50 each for the costume itself! A great time was had by all! HOLY CRAP THIS IS AMAZING. What do you call this method?